where . 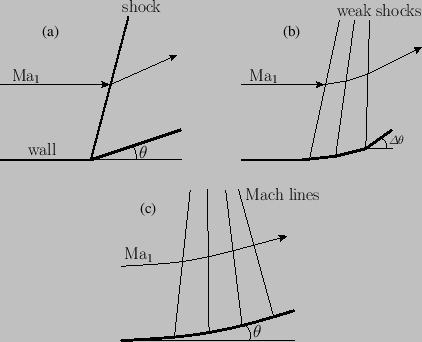 It is apparent that the shock strength, , is directly proportional to the deflection angle, . The changes in the other flow quantities, except the specific entropy, across the shock front are also directly proportional to . (See Exercise iii.) The change in the entropy, on the other hand, is proportional to the third power of the shock strength (see Section 14.8), and, hence, to the third power of the deflection angle. In other words, for a finite deflection angle, , the wave angle, , differs from the Mach angle, , by an amount, , that is of the same order of magnitude as . Figure: Compression of supersonic flow that is turned through an angle . Case (a) shows a single turn through an angle . Case (b) shows the turn subdivided into a number of smaller turns of magnitude . Case (c) shows a smooth continuous turn through an angle .